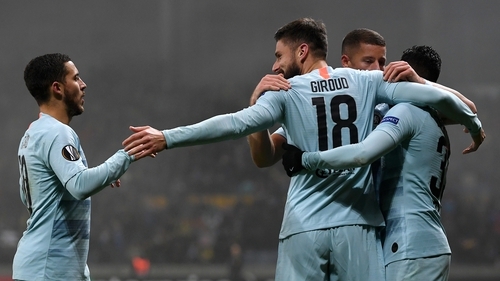 Chelsea's fourth win from as many Group L games - three of them now 1-0 - was played out in freezing fog and memorable only for France World Cup winner Giroud's first Blues goal since May's win over Liverpool. BATE, comfortably beaten last month in London, struck the woodwork three times and Eden Hazard's services were required for longer than anticipated in Belarus. The hosts came close to taking a 12th-minute lead. Dmitri Baga beat Kepa Arrizabalaga with a fine drive from 30 yards, which shook the goalkeeper's left-hand post. A corner soon afterwards was headed on by Stanislav Dragun, with Kepa scrambling clear. Hazard, unsurprisingly, was involved in Chelsea's best moves early on, but there were few chances of note. Giroud had an effort deflected wide after a neat turn from Ross Barkley's pass and the France striker later headed wide with a difficult chance from a Hazard cross. Jorginho fed left-back Emerson Palmieri who, unlike Zappacosta, found his man with the cross. Giroud's downward header at the near post had enough power to beat Denis Scherbitski, but the goalkeeper should have done better. If Chelsea thought their night would become more straightforward from that moment, it did not. A hefty touchline challenge by Maksim Skavysh sent Hazard into his own dugout, the Belgian rising gingerly. And then BATE struck the woodwork for a second time when Dragun's shot was diverted on to the crossbar by Nikolai Signevich. Aleksei Rios blasted over soon afterwards, when more composure would have led to an equaliser. Hazard shot straight at Scherbitski, who next saved a Giroud header. Hazard had been withdrawn by then, seven minutes later than promised by Sarri. Barkley shot over and Jorginho off target and Evgeni Berezkin fired wide for the hosts, who strove for an equaliser until the end. Even Scherbitski came up for a stoppage time corner and in the ensuing scramble Baga hit the post. Chelsea were relieved to see the ball rebound clear as they held on to qualify with two matches to spare and extend their unbeaten run to 17 games, since August's Community Shield loss to Manchester City.